The main purpose of console KOMKON PI – work with all types of traffic controllers KOMKON. Furthermore, this console allows certain actions with devices KOMKON UZVP and wired modems KOMKON. Console KOMKON PI is compatible with all types of traffic controllers KOMKON, regardless of their production time and allows you to monitor the status and operation of these controllers, diagnostics operation of connected circuits, to manage their operational status and to set some parameters. Compared with the early produced control console, console KOMKON PI is characterized by a more rational interface through the use of more unconditional functions. Functions of work with channels have been radically altered and allow simultaneous control from 16 to 48 channels of traffic controller. In the console KOMKON PI has introduced function of traffic controller channel test in the mode “running point” with the possibility of subsequent control of all steps of the test. 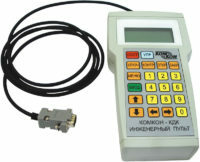 When installed latest versions of boards KDIP and KDP to the traffic controller KDK, as well as connected to the controller KD-03, console KOMKON PI with great accuracy indicates network voltage and clock backup battery voltage. Console KOMKON PI lets you control the version number of its software, the type of traffic controller and version number of its software as well as the type of management system of traffic controller and its network address. In this version of the console it is specified transition KDK into selected phase after pressing the associated digit and the set time execution of the current intertact and maintaining this phase before the canceling by other mode. When working with the latest versions of software for KDP board console KOMKON PI allows you to monitor the status of tumbler switch of manual control at KDPS board state as well as status of circuits of external management: КVP-1, КVP-2, YF, door. With developing of traffic controllers’ and console’s software the number of functions will increase. When the new versions of software for console KOMKON PI appear, we will make its installation in working order to the console KOMKON PI, previously purchased by consumers.